Johnny Gaudreau, LW (NHL.com rank: 28) -- The left wing, who turns 25 on Aug. 13, is coming off an NHL career-high 84 points (24 goals, 60 assists) in 80 games. He leads the position in assists (191) over the past four seasons and is third in points (287). Gaudreau likely will be drafted behind New Jersey Devils left wing Taylor Hall, who won the Hart Trophy as NHL MVP, but fantasy owners should expect similar or better production from Gaudreau after Calgary's offseason improvements (signed James Neal; traded for Elias Lindholm and Noah Hanifin). Gaudreau ranks third behind Alex Ovechkin and Jamie Benn among left wings in points per game (0.92) over the past four seasons (min. 300 games) and should be one of the first five selected at the position. Sean Monahan, C - INJ. (55) -- The No. 1 center had an NHL career-high 64 points (31 goals, 33 assists) despite missing eight games with multiple injuries. It was also the second time in Monahan's NHL career that he had at least 30 goals and 30 assists in a single season (2014-15), and fantasy owners can expect similar production if he's healthy this season. Monahan, 23, gains additional value in leagues that count face-off wins (709; 18th in NHL) and could have his best season yet with Gaudreau and Neal on the top line. Monahan should be available outside the top 50 once again and is a potential fantasy center bargain. Matthew Tkachuk, LW (69) - INJ. ** -- The 20-year-old finished among the top 100 in Yahoo in each of his first two NHL seasons. 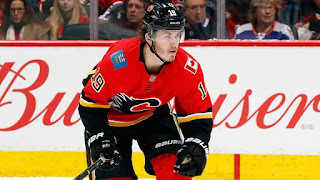 Tkachuk scored an NHL career-high 24 goals, impressive considering he played on the second line at even strength away from Gaudreau and Monahan, and led the Flames with 10 power-play goals. Tkachuk's ceiling is even higher this season after assistant coach Geoff Ward was hired to help the power play (16.0 percent; tied for third worst in NHL). He's missed 20 games over the past two seasons, including nearly the final month of last season with an upper-body injury, but provides the best category coverage among Flames forwards when healthy. Mark Giordano, D (91) -- He's had at least 11 goals and 25 assists for five straight seasons for Calgary. 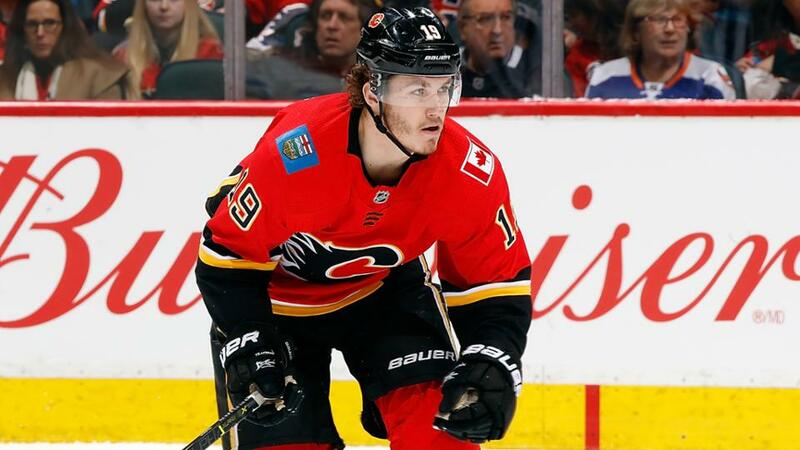 Giordano will see an increased workload after Dougie Hamilton, who led Flames defensemen with 17 goals, was traded to the Carolina Hurricanes. Giordano led the Flames with 24:47 of ice time per game last season and likely will improve his power-play goal total (one) in an even bigger role. The 34-year-old will have constant exposure to each of the Flames' elite fantasy forwards (Gaudreau, Monahan, Tkachuk) and has the durability (missed one game over past three seasons) to finish among the best fantasy defensemen. Mike Smith, G (112)* -- The 36-year-old played 55 games for the second straight season and had three shutouts for the third straight. He also has a .914 save percentage or better in four of the past five seasons. This consistency is what makes Smith an attractive middle-round workhorse goalie option. He should improve his win total from last season (25), especially if the skaters in front of him stay healthy and new coach Bill Peters makes the necessary tweaks. He's a safe target in the 16-20 range among fantasy goalies. James Neal, LW/RW (150) -- He's scored at least 21 goals in each of his 10 NHL seasons and could play with Monahan and Gaudreau on the top line. This would be the best-case scenario for Neal, who could hit the 30-goal mark for the first time since 2015-16 (31 goals in 82 games with the Nashville Predators). Neal, 30, has a strong shooting percentage since 2011-12 (11.9) and the potential to finish among the top 50 fantasy players if he stays healthy (missed 61 games over the past five seasons). Elias Lindholm, C/RW (205) -- The 23-year-old gets a fresh start with the Flames but under the same coach he had with the Hurricanes. Lindholm had his second straight season with at least 44 points and is rounding into a consistent forward that's borderline fantasy relevant. It looked like Lindholm was going to get his best lineup opportunity with the Flames before they signed Neal, but he could still get a trial on the top line. Otherwise, it's likely he'll either play third-line center or second-line right wing. Fantasy owners should take a wait-and-see approach with Lindholm, who could have a breakout season in the right situation. Noah Hanifin, D - RFA (229) -- The 21-year-old defenseman had NHL career highs in goals (10) and points (32) in 79 games with Carolina last season. However, Hanifin finished 400th in Yahoo because he was minus-20, a total that should improve on a more competitive team. Hanifin's lineup placement is unknown with Giordano and possibly TJ Brodie ahead of him, but he has sneaky upside in deeper leagues or off the fantasy waiver wire if he gets 20:00 of ice time or more per game (18:52 in 2017-18).